Hard to believe it has been a year since I reported on the Joint Atlantic Seminar for the History of Biology, (see here). This year’s meeting, held at Penn, was one of the most well-attended in recent memory and featured a dozen well-crafted and dynamically-presented papers from grad students as local as Philadelphia and as distant as Arizona. The meeting was kicked off by a plenary from Penn anthropologist Adriana Petryna, who spoke about work-in-progress on the demise of the sick role and the right to recovery. I am biased (I have worked with Petryna for a number of years), but I appreciated the choice of an anthropologist of bioscience, following on the plenary given by anthropologist Marcia Inhorn last year. Anthropologists’ attention to the life sciences have been informed by historians of biology and the methodological insights being generated through conversations across fields is responsible for some truly important work (here, I’m thinking of Hannah Landecker’s Culturing Life, Stefan Helmreich’s Alien Ocean, and Hugh Raffles’ In Amazonia, though there are many others). Creating a space for anthropology at our table is an opportunity to recognize that our work matters to communities other than our own, which is a good thing. Read about some resonant themes from the meeting after the jump. The first is the question of “phenomenology,” and its connection to empathy. In his talk on Otto Potzl’s neuropsychiatry, Harvard’s Scott Phelps grappled with early 20th century efforts to fathom the brain as a scientific object and the self (cue Hank). He spoke of this in terms of “neuro-phenomenology,” an approach to the physics of subjectivity that required “perceptual empathy.” Ok, there’s a lot going on in that sentence, but what I think Phelps might be talking about is the personal equation that characterizes encounter in the human field sciences. Or, perhaps literary analysis, as was beautifully described by Princeton’s Sarah Eldrige in her account of the family and the rise of the novel in 18th century Germany. She spoke of empathy as a way into understanding new ideas about interiority and epigenesis. What work does “phenomenology” do for Potzl . . . and for Phelps? Is it an effective way of linking the material to the affective? Or does it obscure that very relation? Phenomenology was also invoked by Hopkins’ Adrianna Link on efforts to create a film archive of disappearing human cultures in the mid-20th century. She described how these 8 million feet of anthropological film were intended to be a “phenomenological” resource for the science of man. What kind of “perceptual empathy” is called upon to make sense of this sort of evidence? Again, I found myself wondering about what phenomenology, as an actors’ category, obscured. As historians of life science dip into anthropology, history of technology, etc., we can reconstitute ways of thinking and talking about the material and the social. I was fascinated by the resurgence of risk in several papers. Robin Scheffler, from Yale, gave us a remarkable story of role of Simian Virus 40, first a contaminant and then an experimental organism, in driving research in cancer biology and regulation of vaccine production. Scheffler went beyond the “follow the thing” approach to show how the thing is constituted in relation to a broader physical infrastructure and affective context of anxiety about health and security. Penn’s Mary Mitchell engaged with risk in a different way, trying to make sense of how human geneticists reckoned with the application of their insights in the realm of prenatal screening. Mitchell linked the clinic, lab, and field as she tracked concerns about risks to individuals and to populations. The tension between the individual and the collective is an old theme, newly rendered at this JAS-BIO. Richard Nash from Hopkins’ has bravely begun to rethink the eclipse of Darwin to reveal a richer landscape or “milky way” of efforts to understand variation. Penn’s Maxwell Rogoski’s account of Curt Stern’s travels in the American South demonstrated how theories of variation were constructed with regard to shifting racial politics. Harvard’s Myra Perez examined the multiple personas of Stephen Jay Gould and their relative impacts on debates over the role of science in American democracy. On this last theme of individuals and collectives, I want to offer another explanation as to why environmental history was relatively absent from this year’s meeting: the proliferation of new forums dedicated to the subject. 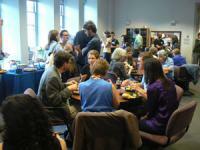 Along with the ASEH, the fledgling Yale graduate student conference met the week before JAS-BIO. It’s probably safe to say that if the two meetings had been scheduled further apart, we might have seen overlap in participants. The more places people have to gather, the better, but this will surely have consequences for group identity. I agree with Lukas that the burgeoning relationship between environmental history and history of science is one to watch. So, I’m casting my vote for an environmental historian as plenary speaker next year, when JAS-BIO meets at Woods Hole! This entry was posted in anthropology, environmental history, JAS-BIO, Joanna on April 25, 2012 by americanscience. This is really interesting, Joanna. One of the things that fascinates me is that structuralism and post-structuralism both tried to overcome phenomenology (represented by the likes of Sartre and Merleau-Ponty in France). They did this by attacking the notions of consciousness and the “subject” and embracing antihumanism. Thus, in philosophy, history, and all of the “studies” fields of the 1980s and 90s individuals get swamped out by discourses, language, constructions of identity, etc. It seems to me that we have something very interesting happening in the present. First, some people are really interested in a materialist account that treats humans and non-humans as having causality. We've seen this a lot on American Science recently. Latourianism and other forms of recent materialism could be seen as a continuation of the antihumanist line. But second, we hear people referring to phenomenology, which is in some sense–for a historians–a return to the reconstruction of the historical subject's experience and consciousness (I would think). Can these two things–materialism and phenomenology–be brought together? Or will the two never meet (except through some form of neuroscience that would be unlikely to help historians)? I wonder how anthropologists, who are so extremely self reflective about the relationship between change, self-presentation, and the role of the observer, would deal with this seeming divide.